Sorry if this is a stupid question but I have the AE installer 2 for but I want to be able to play the original Oni levels as well as the new ones but with the features from AE. Is there something I should download for that? You just install the mods / features you want using the AEinstaller and they will apply to original oni levels as well as new ones. example installing HD Konoko will make Konoko use her HD armor in any level she uses that outfit. Just read the instructions once you open the AEinstaller and the ''Help'' from the help menu, everything is self explainatory. Only if you open the Oni.exe within the AE/ folder will you see the mods you installed taking effect. Oni.exe in the main Oni/ folder will still be vanilla Oni. If you're definitely not seeing the mods get installed, though, you can go into the AE Installer's Help menu and choose "Request help...", and it will send us your logs so we can diagnose. After you install the mods click on the run oni windowed or full screen button from within the AEinstaller. Thanks for the logs, but I actually can't find anything wrong there (though you did install a lot of mods, and that might cause a problem). Have you tried what Samer suggested above, in order to make sure you launched the right Oni.exe? Oh, and on another note, is there a folder anywhere with Konoko's voice samples that i can delete to stop those cheesy punch lines from occuring? As for switching characters, the easiest way is to enable developer mode. To do that, open up your objectives screen (standard key is F1) and just type in 'thedayismine'. Remember to have Caps Lock turned off while doing this otherwise the cheat won't work. Then press F8 to cycle through characters. You can also use F7 to cycle through weapons. Furthermore this mode enables you to use console commands. Have a look on the Oni Galore for things to toy around with. It's been a while since I last started on a fresh save of Oni, so you might have to play through the game first for cheats to be enabled. Don't hang me up on this though, I've no clue if the AE just automatically make cheats available at any time. Nope, we're not enabling cheats in the AE. The assumption underlying the Edition at the beginning was that only a veteran player would be installing it, so they would have beaten the game and unlocked cheats. But there are save-game editors that one can use to unlock cheats. Check the Tools menu in the AE Installer. As far as Konoko's "punch lines", I'm not sure what you're referring to. Her taunts? Ah, I've been reminded that the Daodan DLL, which comes with AE for Windows, does enable cheats. That slipped my mind. Cool, thanks for the fast replies. The dev mode actually worked for me, and I'm hardly at the Manufacturing Plant. Does this mean all cheats will work for me, or is the dev mode always accessible? [Edit: Your second reply just loaded for me] About the save game editor, is that included within Vago? Cause there are only 2 tools showing up and they're the Key Editor, and Vago. On another note related to Vago I have tried inputting the "Anniversary Edition Folder"(as it stated), then i tried every folder containing game content in it, and nothing ever showed up on Vago from any of the attempts(I did restart Vago on every trial). I'm not planning on messing with Vago at all, but i wanted to at least get it to work in case i need it later. One final question, is there any point for me to go back to the original version of the game because I'm not a "veteran"? I am very much enjoying the texture mods. Cool, thanks for the fast replies. The dev mode actually worked for me, and I'm hardly at the Manufacturing Plant. Does this mean all cheats will work for me, or is the dev mode always accessible? Yep, if Dev Mode is enabled then all cheats will work. By the way, enabling Dev Mode tends to enable console output for various errors that happen during gameplay. If you only want to shapeshift you can just use the code "shapeshifter" instead of "thedayismine" to enable F8/Shift-F8. About the save game editor, is that included within Vago? On another note related to Vago I have tried inputting the "Anniversary Edition Folder"(as it stated), then i tried every folder containing game content in it, and nothing ever showed up on Vago from any of the attempts(I did restart Vago on every trial). Not sure what happened there. You might want to look for a Vago thread to ask your questions on the tool. One final question, is there any point for me to go back to the original version of the game because I'm not a "veteran"? I am very much enjoying the texture mods. Well, personally I wouldn't recommend someone who was unfamiliar with Oni to play through it for the first time using a bunch of mods. It could be confusing as to which parts of the game are original and if something was broken by a mod you might not be able to tell. The base AE (no mods checked) only changes one aspect of gameplay, which is that it makes all moves available from the beginning. This affects the difficulty curve a bit, but it was done because veteran players get annoyed when they restart the game and don't have access to moves they're used to having. By "punch lines" i meant both the taunts, and the voice samples it displays when you do the double spin kick (and the other punch move i cant remember the name of). If you switch your character to the "Generic_Female_1" you can see she still has the moves, but it never displays the particle effects, or the voice sample. It is true that the lines are cheesy (they were going for a kind of "animé action grrl" thing), though I don't think I've heard this request before. We don't have any mods ready-made that remove the combat dialogue, though it would probably be easy for someone to make a patch to remove them. I'm not actually sure why a generic female has Konoko's super moves, in fact. That doesn't seem right. 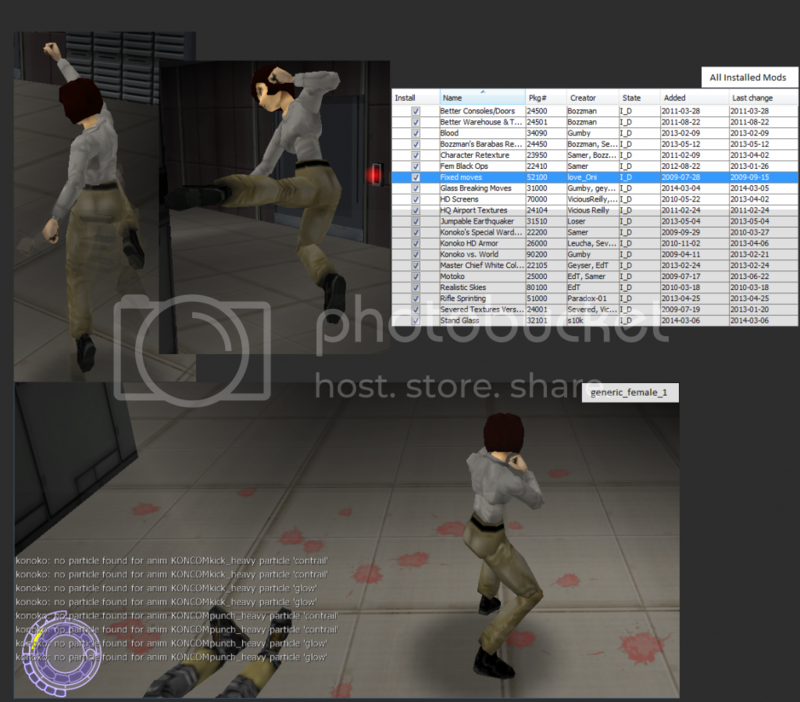 You might have a mod installed like Brutal AI that is messing with character's movesets. I'm not actually sure why a generic female has Konoko's super moves, in fact. That doesn't seem right. You might have a mod installed like Brutal AI that is messing with character's movesets. The only mods I have that effect combat are "Fixed Moves, Glass Breaking Moves, and Jumpable Earthquaker", and i don't think those would add moves to irrelevant characters, but if the AE adds all the supers I'm guessing it could be from that. And about installing the save game editor, I threw it into the Program Files(x86) >Oni >AE >Tools folder, and its not showing up in the AE tools tab. I'm not too concerned with getting this to work either, as I'm planning on finishing the game anyways. On another note, I was also wondering how to get into those custom arenas and maps after installing them. I have only tried one of them, just to try and figure it out, but have had no luck yet. Is there a thread on this? No, the core mod "Unlock All Moves" only unlocks Konoko's combos, it doesn't give them to anyone else. Just to be clear, there's only two supers per character, the heavy punch and heavy kick. Konoko's supers are Rising Fury and Devil Spin Kick. Those combos and other advanced combos like the Lariat and Backbreaker should only be possessed by Konoko. Konoko's moveset is however layered on top of a standard female moveset, so female civilians and cops have some of the same basic moves. I think the Brutal mods copy Konoko's advanced moves back to the other female non-Fury characters in order to make the AIs more powerful, but that's the only way I can think of that female civilians would have all of Konoko's moves. And about installing the save game editor, I threw it into the Program Files(x86) >Oni >AE >Tools folder, and its not showing up in the AE tools tab. Sorry, it would have to be installed by the AE Installer in order to show in the menu, and to be installed by the AEI it would have to be a tool package, and it was never made into one. You should unlock all SP levels first (complete the game). The custom levels are often placed in the numerical gaps between existing levels and they're supposed to unlock themselves upon installation so that they appear in the Load Game dialog, but maybe if you are still playing through the game, they are not showing up because they come after your current level. It won't change much, but unfortunately we don't really have new textures done past the first few levels. Yep, Oni is a special game, there's not many like it! I think the Brutal mods copy Konoko's advanced moves back to the other female non-Fury characters in order to make the AIs more powerful, but that's the only way I can think of that female civilians would have all of Konoko's moves. It's all good, at least the re-textured characters are always there. Interesting, thanks for documenting this. It seems that even in vanilla Oni, generic females inherit the full moveset of Konoko. Probably some modders have known this before now, but I never dabble in animations so I was unaware of this. So actually nothing changed in the AE except that Konoko's advanced combos became available for generic females earlier in the game than normal (since the Unlock All Moves core mod affects the move itself, for anyone who can use it). yup they always could but didn't use them because of their melee profile. Ah, right, that must be another reason I didn't know this. Of course, a lot of the civilian AIs also seem to be set to panic rather than fight. Is that what you meant by melee profile, or just that when they do fight, the profile doesn't tell them to use those moves?